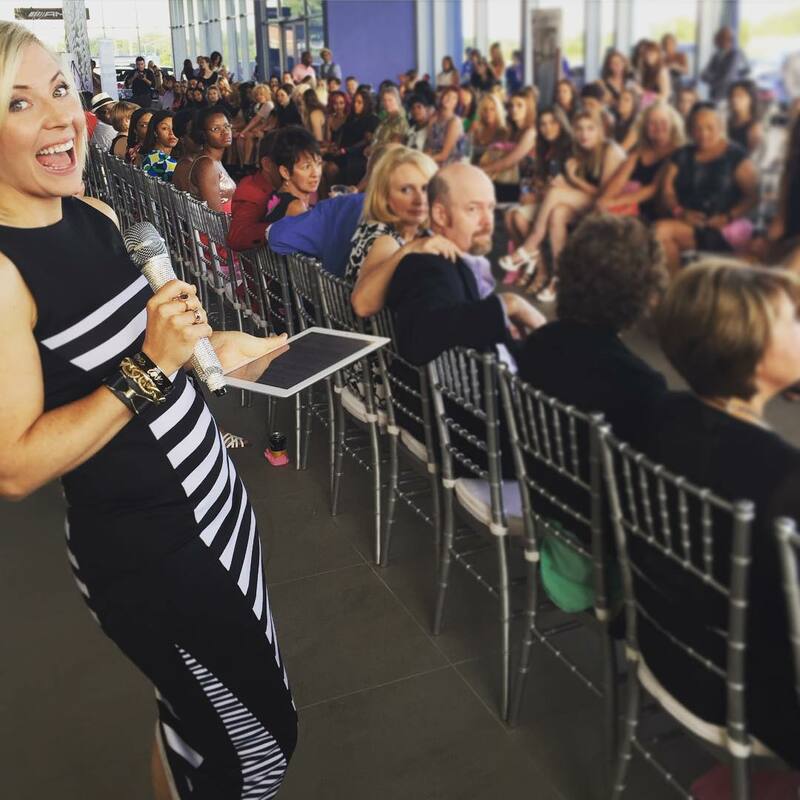 2017 Cincinnati Fashion Night – Details Announced! If you like to shop and support local, and see what kind of creative talent we have right here in the Tri-State, you won’t want to miss our annual Cincinnati Fashion Night event! This year, we’re featuring three local designers — ranging from luxury jewelry, functional and fashionable eyewear, to athleisure — as well as a huge pop-up shop area where you can shop with lots of local businesses, and then we’ll have food and drinks there too! We’ll even have the always-lovely and fun Molly Wellmann there serving up cocktails and doing demonstrations! SO FUN! We hope you’ll join us! All the details and RSVP info is below! ENJOY: Three-part fashion show series of local designers, cocktail demos by Molly Wellmann, drinks & light bites, and shopping with a variety of local businesses & pop-ups. $20 general admission ticket includes: swag bag, refreshments, and standing room for fashion show. $30 VIP ticket includes: swag bag, refreshments, fashion show seat, and chance to win 2 Ultimate Air Shuttle tickets. Next up in my Cincinnati Fashion Night Sneak Peek series (last week I featured Style Room 326) is GKM Design, another one of our fabulous local designers who will rock the runway July 22! I met the founder and designer Geetha years ago, and I remember her being a stunning beauty who was impeccably dressed. This was back when becoming a fashion designer was a figment of her imagination… she was working a 9-5, with no formal training in fashion or design. But since then, she got married, and that’s what sparked her passion that had been smoldering all those years. She had a vision for the kind of bridesmaids dresses that married (pun intended) her Indian culture’s love for color, fabric and embellishment, but with American silhouettes and dress design influences. She couldn’t find what she was looking for, so she created her own. And after that, she created special occasion dresses for herself and others. Today, it’s a full-blown business that will debut on a runway for the first time at our event. We’ll also learn about the women and business partners around the world that her sales provide sustainable jobs for. Click here to learn more about Geetha and GKM Designs, and see her creations for yourself on July 22 at our second annual Cincinnati Fashion Night! Details below! ENJOY: Three-part fashion show series of budding designers with Tri-State roots, and an exclusive shopping experience featuring a variety of local businesses and pop-up shops. TICKETS: $10 general admission ticket includes swag bag and refreshments. $20 VIP ticket includes swag bag, refreshments, seat along runway, and chance to win a trip for two to Chicago viaUltimate Air Shuttle to visit Style Room 326. Details about Our Annual Cincinnati Fashion Night JUST ANNOUNCED! Exciting news! 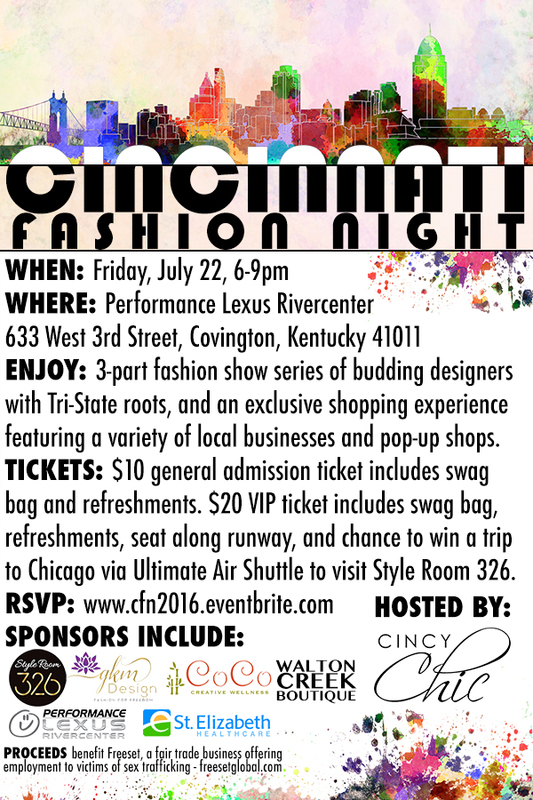 We just released details about our annual Cincinnati Fashion Night! It’s like a one-night Fashion Week event featuring local designers and businesses! We’ll have a three-part fashion show, a vendor area packed with pop-up shops of local businesses and boutiques, plus food, drinks and swag bags for all attendees to enjoy! Details below — click here to RSVP! Hope to see you there! TICKETS: $10 general admission ticket includes swag bag and refreshments. $20 VIP ticket includes swag bag, refreshments, seat along runway, and chance to win a trip for two to Chicago via Ultimate Air Shuttle to visit Style Room 326. First-ever events scare me. I guess since I’ve been running Cincy Chic for the past 8.5 years and most of our event concepts repeat each month, it’s rare when we decide to change out a concept and try something new. But we wanted to do our version of a Mercedes Benz Fashion Week right here in Greater Cincinnati (technically NKY) and work with lots of local designers. Typically we work with ONE fashion designer… and this was working with five. It was a huge undertaking, and yes, pulling together the logistics of this terrified me because I wanted it to go flawlessly. And I’m proud to say that… IT DID! We had HUNDREDS show up, we collected TONS of business suits for Dress for Success, and we had three incredible shows featuring five different local designers. I’m so proud of my team, so grateful to our sponsors, and so happy that our attendees came out in droves to support the cause, our event and our designers. Needless to say, this concept is a DEFINITE must-repeat event! Hope to see you at next year’s Cincinnati Fashion Night! Thanks again to all our sponsors…ESPECIALLY our beautiful venue sponsor, Mercedes Benz of Ft. Mitchell! !